Rejuvenated after taking a dive into the ambient undercurrents of their sound on 2014's Celestite, Wolves in the Throne Room are back with a properly metallic full-length. 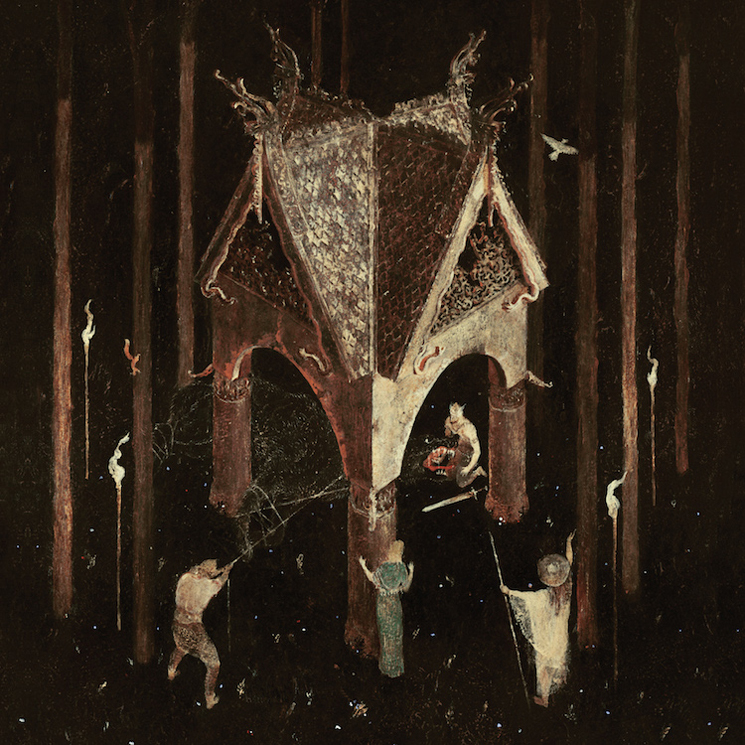 Thrice Woven sees the Weaver brothers continuing on their path of sonic and textural exploration, a trajectory set with great effect by the choral, synth, percussion and string-featuring Celestial Lineage. While that album was billed by the band as the conclusion to a trilogy of sorts, fans expecting Thrive Woven to offer glimpses of rebirth will be disappointed. The source of this disappointment is something of a paradox. What made WITTR so compelling a group to begin with was their commitment to expressing a deeply cultivated sense of place. In this case, the Weaver brothers' connection to the Pacific Northwest infused their music with the sort of magical and ethereal aura wholly different from anything a Scandinavian group might be capable of producing, for example. In tirelessly pursuing this aura, Thrice Woven have lost sight of their original vision. Nearly every track on the record relies a bit too heavily on what now feel like the standard devices of a mysterious metal sound: pastoral acoustic guitar ("Born From the Serpent's Eye"), supernal choral vocals ("Mother Owl, Father Ocean"), the sound of a fire crackling in the night ("The Old Ones Are With Us"). The problem with WITTR's reliance on those devices is twofold. The first is that the guest spots nearly steal the show. It used to be that listeners were transported to the band's dwelling place through buzzing guitars, rolling drum fills and cascading analog synth. Now, that transportation is seemingly done by everyone but the band. The second downfall of this more orchestral approach is that it thwarts all sense of subtlety. In the past, the band would craft odes to season's change with whatever was at their disposal. Now, guest vocalist and Neurosis axeman Steve Von Till essentially announces the arrival of spring on "The Old Ones Are With Us."